For a man as old in age and empty in character, as Stamfo Nwankwo to have allowed himself to be sent on a fool's errand by his shylock slave-drivers is a reflection of the content and quality of his person. That Nwankwo also chose the person of Chief Achike Udenwa as the subject of his base vilification, is a pointer to the emerging antics of a clique of political opportunists, who are bent on domesticating the culture of ingratitude in our land. The show of shame tagged OPOCA summit was merely an assemblage of galley slaves constrained by executive pressure to play out a script inspired and funded by an unscrupulous Chief Executive. While some literally bent backwards to play out their roles, Samfo Nwankwo and his kitchen crew remorselessly revelled in the atrocious display of ingratitude to the point of almost believing the falsehood they churned out to their rented audience at the event. Even the rented audience knew there should be a limit to political rascality. And right in the presence of the bemused Deputy Governor of Imo state and the phalanx of thugs and armed security personnel, the rented crowd revolted against the wild mendacities spewed by Stamfo Nwankwo. Nwankwo who likes to address himself as the National President of the Orlu Political Consultative Assembly (OPOCA), in his illusion described OPOCA as a “clearing house” for all political aspirants of Orlu extraction. Such a tall dream! We however make bold to say that the 'Orlu' where Stamfo Nwankwo and his likes would emerge as leaders, does not exist anywhere. Even if Nwankwo is given two life times, he will never be able to gather enough virtues to qualify to lead Orlu people. As a politician, Nwankwo is a failure: He has never won an elective office in all his miserable life in spite of his many failed attempts. As a public servant: He has also failed. 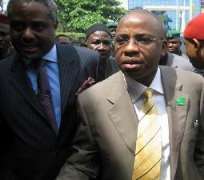 He ran Imo Broadcasting Corporation (IBC) aground as the Director General and narrowly escaped prosecution. There is no doubt that we would be singing the dirge for ITC by the time he leaves office as Board Chairman. As a family man, Nwankwo is a failed husband and father. With his first marriage crashed and the second one irrevocably damaged, Nwankwo has never had the parental presence of mind to build a home with his family but rather prefers hopping from hotel to hotel. A non-resident father! It will therefore amount to an insult on Orlu people to even vaguely suggest that such a man as Stamfo Nwankwo who has barely survived the breadline could lead Orlu with his notorious lifestyle bereft of any form of morality and bedevilled by social vices. It is not surprising though, that such a man as Nwankwo who has never succeeded at anything in life, is over-doing it now he has discovered late in his life that he may after all be able to make a success of something - being a nuisance! And he is going about it with desperate vigour to the point of extreme delinquency. Such is the case when an aged and shameless adult chooses a political role only demented teenagers would dare touch. In a functional society, the likes of Samfo Nwankwo is only fit for remand homes. Unfortunately, it is only in a state like Imo that such elements like Nwankwo would be considered sane, enough to get patronage from government. The status of Stamfo Nwankwo as a sleaze bag is enough to dismiss his posturing of OPOCA as a relevant body in Orlu. For a man who has become a perennial parasite to every government in power; a man without any decent skill or knowledge; and above all a man who is by all standards jobless, OPOCA is merely a fraudulent business concept hatched by a pathologically corrupt and indolent mind. For the benefit of doubt, OPOCA is not for Orlu people but for a few individuals. OPOCA does not represent public interest but clique interest. Put succintly, OPOCA is a meal ticket for Stamfo Nwankwo and his band of booty hunters. Watching Nwankwo describe Chief Achike Udenwa's eight years in office as wasted years, noticeably signalled the setting-in of tell-tale signs of mental collapse. Any close observer would agree that Nwankwo is gradually edging closer to stack lunacy. When a man who claims to represent the interest of Orlu brags that “top on our shopping list for Ohakim is the reappointment of Cletus Ilomuanya as the chairman of Imo State council of Ndieze”, it shows that Nwankwo and his group are actually blind to the needs and priorities of Orlu people. Hence, for every man and woman who is Orlu at heart, Nwankwo and his gang are more of the problems than the solutions to the myriads of challenges facing Orlu today. They have gone further to politically criminalize the traditional institution. We have resisted the temptation of dignifying the sponsored lies and fabrications against Chief Achike Udenwa, with any form of response. We are convinced that discussing Chief Achike Udenwa in the light of Nwankwo's allegations and assertions would amount to great disservice to good conscience. Stamfo Nwankwo is a scourge in our land whose character traits bear no affinity to the virtuous qualities for which the average Orlu man is known. If indeed he is an Orlu man, he must be a mutant, an error in history that must be redressed by posterity. OPOCA also sought to size-up the incumbent Governor, Chief Ikedi Ohakim alongside Chief Achike Udenwa, but we would not be drawn into any argument on the fraudulent estimation of their worth and importance until the incumbent has done enough to deserve an assessment. For all we know, Udenwa's only sin is his modest approach to life. And like they say, “it was a great day for fools when modesty was made a virtue. For it brings the genius and fool down to the same denomination”. Our message however, is clear: OPOCA is an amalgam of fraudsters driven by greed and does not in the least represent the interest of any people. Nwankwo and his group have wasted their generation and we would not let them pollute the future of Orlu. While they languish in their fool's paradise, Orlu people should gird their loins as we move to restore all we have lost through this despicable case of adult delinquency. Even if there is nothing else you know about Orlu, you must know that in Orlu, scoundrels do not lead!